If you’re experiencing low mood, depression, and anxiety, a new provincial program is now available to help. The program is managed by the Canadian Mental Health Association (CMHA) Ontario and CMHA York and South Simcoe. Telephone coaching and workbooks: BounceBack is a guided self-help program in which a coach supports you in working through a series of workbooks. The program involves three to six telephone coaching sessions, which you can do from the comfort of your home. Workbooks and coaching are available in multiple languages. Online videos: BounceBack Today videos offer practical tips on managing mood, sleeping better, building confidence, increasing activity, problem solving, and healthy living. The videos are available in English, French, Mandarin, Cantonese, Punjabi, Arabic, and Farsi. A referral is required to participate in the BounceBack telephone coaching program. Your family doctor or nurse practitioner can provide you with a referral. Alternatively, you can self-refer. 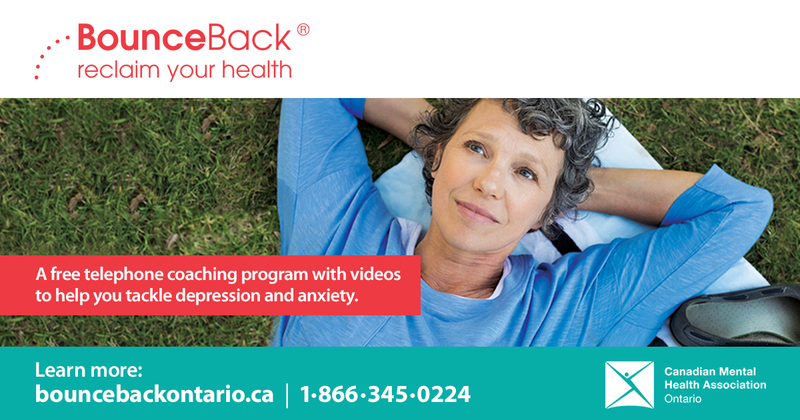 To learn more about the program and access the referral form, visit: bouncebackontario.ca.